Since 1995, we've been a fair, authoritative and opinionated place to find out all the scandals and character details on all major candidates for president. All of our sources are listed at the bottom of each page, including page numbers and URLs with links where possible. We rely on mainstream publications, and aren't interested in conspiracy theories. Frankly, you don't need them with most candidates. Consensus reality has plenty of dirt already. Though this may sound negative, we are very optimistic. (Who is "we"? Start with the editor, Mark Saltveit. You can read more about our group here.) We think that if you put out good information on politics and present it well, people can make up their own minds and choose well. That's why we don't need to endorse anybody. What's wrong with the entertainment and news media? - the news media are deliberately forgetful. If a story has ever been reported, it's not considered "new" and so they won't report it. We think if a politician was convicted of corruption 10 years ago, you should know that when deciding if he or she should be president. We provide comprehensive and edited archiving and synopsis. At best, the mainstream press will sell you copies of their old articles for $2.95 each, with no context or perspective. - the phony type of "objectivity" defined as "quote a Republican insider and a Democrat insider and make no further effort to piece together the truth." Real objectivity does NOT mean the reporter has no opinion. Anyone with a pulse has an opinion. The reporter's JOB is to have an opinion, to aggressively dig up the facts, and apply his or her carefully honed opinion to sort it all out. Politics is always murky. There are always allegations and denials, spins and flat out lies. The passive approach of "just quote each side" is very easily manipulated, and it happens every day, constantly. Objectivity means the reporter is ultimately alone with the facts, and must make a SUBJECTIVE decision what to write. They must be independent of organized agendas and interest groups, not independent of their own judgement. Good reporters are always out on a limb, and their reputation will depend on their accuracy and fairness. The best and fairest reporting today in America is the Wall Street Journal's, despite its open conservative bias and ties to Republicans. (I exclude the editorial page, of course.) Despite who pays their rent, they report fairly and aggressively on their friends as well as their enemies. They print dirt on Gingrich and Alexander as well as Clinton; and though they have scrutinized every inch of the Whitewater scandal and sell books hyping it, they aren't afraid to run news articles saying it might be overblown. Their biases are open for all to see and adjust for. If every city in America had a newspaper that good, politics would not be a problem, and we'd be solving some of our very big problems. - and lack of real investigation and reporting. Among newspapers, only the Wall Street Journal and the 2 Washington papers investigate aggressively. Magazines (including such unlikely candidates as Vanity Fair) have taken over most of the investigations, and these are usually ignored by the mainstream press. Many of our best items were published in relatively mainstream magazines such as Financial World, The Nation, and National Review, without being repeated in the New York Times, Time or TV news. The Skeleton Closet is NOT a blog -- if anything, it's the ANTI-blog. This is an organized, well-researched archive. Blogs live totally in the moment. They're the work of obsessed individuals who post any new tidbit they find, every few minutes at times, for an obsessed audience desperate for the latest tidbit. Quality, accuracy and perspective are all less important than speed and novelty. We don't care about getting out some fact -- with less reliability -- 3 hours before the Washington Post does. Our goal is to have solid information, with perspective, humor and insight, available 24/7. Most presidential candidates are 45-70 years old. Their character isn't going to change in the next 6 hours, or the next 6 years. But because this is politics, accuracy is critical. That's why we list our sources at the bottom of each page, and welcome corrections and perspective via email. We use books and mainstream publications as our sources, not rumors, blog speculation and anonymous tips that probably come from the opponent's campaign. Frankly, the regular media does a pretty damn good job of uncovering scandals, if you know how to research and dig them up. Their problem is ignoring ones that aren't new, and fear of providing perspective and personality in their coverage. This makes it easy to manipulate reporters -- in fact, a standard technique for political consultants is to leak their own candidate's scandal, but at a time when no one is paying attention (and ideally, to a disreputable journalist.) Then, in the heat of the campaign, they can argue that this is "old news", and the press will usually ignore it. Our goal is not reporting news. We're the SECOND draft of history, character portraits of people asking for the most powerful job in the world. The scatterbrain, unreliable world of blogs is the last place to look for information that important. We could go on, but we're all too busy trying to make a living. So are you, probably. We love to hear feedback, criticism, or support via email. 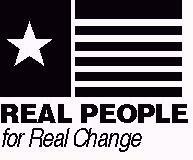 Paid for by Real People For Real Change and not authorized by any candidate or candidate's committee.